Joy Creek Photo Archive (c) all rights reserved Saxifraga paniculata var. minutifolia is sometimes listed as Saxifraga paniculata var. baldensis. 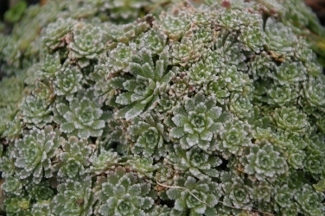 It is the tiniest of the encrusted saxifrages that we grow with rosettes measuring no more than 3/8-inch in width. The blue green leaves are lime-encrusted near their tips and the rosette is more compact with tighter leaves than many of the other species. The short bloom spikes are about 2 to 3 inches in height bearing a scattering of starry white flowers. Grow this in a rockery, trough or container where you can montior it. Make sure to use a gritty mix. We top-dressed our container with an inch of 1/4-ten gravel and grow it with morning light with protection from the hottest sun. Early summer. 1 in. x 6 in.